A mantram, when rightly sounded forth, creates a vacuum in matter, resembling a funnel. This funnel is formed betwixt the one who sounds it forth and the one who is reached by the sound. There is then formed a direct channel of communication. You will see therefore why it is that these forms are so carefully guarded and the words and keys concealed. Their indiscriminate use would but result in disaster. A certain point in evolution has to be reached, and a similarity of vibration somewhat achieved, before the privilege is afforded the pupil of being custodian of a mantram whereby he may call his Master. ‘Meditation is a service activity for people who believe in the power of thought, because its work takes place strictly at the mental level. The power of thought is now accepted as a reality, and the quotations, “Energy follows thought” and “As a man thinketh…so is he”, are frequently heard. Energy does indeed follow thought, and the energy of goodwill is no exception. The mind is, in fact, a better carrier of the potency of goodwill than the emotions. Goodwill needs directing, and it is the mind that gives the direction, enabling the individual or group to invoke this energy and direct it into the desired channels. And so much more. All those teachings are automatic changes in our Selves, through the sincere diligence of meditation and the effort of putting into practice those directions whispered from the awakened soul. Having lived in ignorance and deep karma for over half a century, looking in on how life should be, I choose to live the last half of my life as above. Ignorance brought with it constant guilt – for always being a sinner, so it seemed; a sense of futility – because it seemed impossible for me to change; and hopelessness – for though I knew in spite of all that ignorance and its cohorts that I was ‘saved by Grace,’ I knew there was a better me inside just busting to get out, yet never managed to do so. Now that I have tested the Promises of this esoteric teaching and experienced the Promises are immediate and constant, I find the karma has been canceled or greatly lessened, opening the door to freedom – and the Promised Great assistance – to change . . . without guilt and with great anticipation, gratitude, and ecstasy. Following are some of the best mantrams to help you connect with your soul. Read the information on the links in the paragraphs just above and remember, when you tend to get bored or discouraged, it isn’t about entertaining yourself or manifestation (a natural occurring result of sincerity), but it is about the quality decision to make yourself available to God’s Plan for the extremely powerful spiritual energies to flow through you – during your meditation focus – enhancing the efforts toward the higher thinking of the entirety of mankind. In speaking the mantrams as you remain in your meditative focus, their Truths, along with the inevitable residual energies flowing through you, will expedite your own spiritual growth, perception, and understanding. In other words, expedite the perfection of the ruling of your soul – our true purpose for existence on Earth. From that centre I, the one who serves, will work. In my heart, through my group, and throughout the world. Let That Light permeate Earth and mankind. Let That Love, Christ, and Goodwill permeate Earth and mankind. The purpose which Your Masters know and serve. Let Light, Love, and Power perfect Your Intention for Earth, God, that Earth be a sacred planet, a beacon of inspiration, and a testament to Your Strength in all Your cosmoses and universes. On the surface, the beauty and strength of this Invocation lies in its simplicity, and in its expression of certain central truths that most people, innately and normally, accept — the truth of the existence of a basic Intelligence to Whom we vaguely give the name of God; the truth that, behind all outer seeming, the motivating power of the universe is Love; the truth that great Individuals have cyclically come to Earth and embodied that love so that we could understand; the truth that both love and intelligence are effects of what is called the Will of God, and finally the self-evident truth that only through Humanity itself can the divine Plan work out. It is natural, at times, to feel powerless when faced with the enormity of the pain and suffering upon our planet; we sense the need yet often feel our attempts to contribute in any truly constructive manner are futile. In the past, individuals generally turned to prayer for protection and for the alleviation of suffering in their personal lives. Today, as we enter into a new age, humanity is collectively demonstrating a deepened understanding of the power of group prayer and invocation for the benefit of humanity and the planet as a whole. 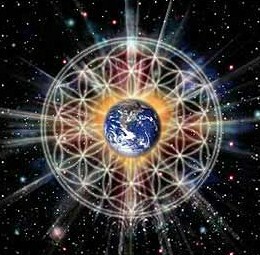 The focused and dynamic use of the Great Invocation gives all people everywhere a potent means of contacting and distributing powerful spiritual energies, thereby contributing to the upliftment and transformation of planet Earth. Through its collective use we bring light and love and power to bear upon all aspects of our planetary life, irradiating and uplifting human consciousness — contributing towards the transformation of the largely material focus of our world into one that is more truly spiritual. The focused use of the Great Invocation causes powerful changes in one’s life — one’s attitudes, intentions, character and goals will be changed and made spiritually useful. “As a man thinketh in his heart so is he” is a basic law in nature; the constant turning of the mind to the need for light and the prospect of illumination cannot and will not be ineffectual. NOTE: A Prayer for the New Age, given by Maitreya the Christ, is a great mantram or affirmation with an invocative effect. Using this prayer will enable one to recognize that man and God are one, that there is no separation. The ‘I’ is the Divine Principle behind all creation. The Self emanates from, and is identical to, the Divine Principle. The most effective way to use this mantram is to say or think the words with focused will, the attention at the ajna center between the eyebrows. When the mind grasps the meaning of the concept and, simultaneously, the will is brought to bear, then those concepts will be activated and the mantram will work. If said seriously every day, there will grow inside you a realization of your true Self. Finally recognizing the creative power of your thoughts and words will enable removal of the those gratuitous parened words. I am one with my group family and all that I have is theirs. May the love that is in my soul pour forth to them. May the strength that is in me lift and aid them. NOTE: “This mantram voices the essential service which every accepted disciple gives to all his brother disciples. This he gives spontaneously with no thought of loss. It becomes as natural and as constant as breath itself. As One with You, God, may our United Power pour through the group of all true servers. May the Love of our United Soul characterize the lives of all who seek to aid the Great Ones. May I fulfill my part in the One United Work through self-forgetfulness, harmlessness, and right speech. We know, O Lord of Life and Love, about the need. That we, too, may love and give. NOTE: “Meditation groups perform an invaluable service. What more can be done during the present world emergency? Let us touch all human hearts anew with love, so that those who know will love and give. Let us give love ourselves. Let us join in the common task of leading humanity into the fields of peace. The white magic of group work can use mantric sound to attract money for spiritual work. In the past, crude forms of mantrams have been used to get money for individuals. Because of developed mental power we can now use mantrams for group purposes, to meet the need of humanity as a whole. One of the more recent groups in the Hierarchy for a specific purpose has been called the financial group. This group has been an outstanding success, inspiring the use of money for philanthropic work all over the world. Here we have humanity aiding humanity, a great spiritual step forward. Now we are entering a new cycle of action by this financial group. There are now enough disciples exemplifying selflessness, harmlessness and right speech so that they can be trusted to use money rightly for spiritual purposes. We are entering a new age of abundant money for the work of Hierarchy and the Christ. The evil result of misuse of money is one of the main causes of the death of our civilization. Our continuing world crisis is more and more focusing on economic factors. The door is now wide open for each one of us to cooperate with this new age action by the financial group in Hierarchy. I am a point of light within a greater Light. I am a point of sacrificial Fire, focused within the fiery Will of God. to perfect the ways of God. This affirmation “and thus I stand” is a declaration of a goal. Few there be who now stand as here stated. The Masters in the Hierarchy so stand and we all, if we so choose, can some day thus stand. Meanwhile, we can all legitimately use it as the affirmation of our goal. Its right use opens the door through which we can pass, surprisingly soon, to partial achievement. Its right use requires due humility. Its inspiring call gives wings to our feet and brings in the magic of Mercury. Holding it in our consciousness brings joy in our goal of world discipleship and speeds us on our way. The first part is the declaration of our soul. The second part is a statement of the program of every world server. The third part is eloquent of being in this world but not of it, evidencing the combined knowledge of the soul and the personality. It reminds us that the personality is not to be crushed but to be used. At the fourth initiation the personality completely surrenders to the soul with no reservations whatsoever. Those who dare to face the consequences can rightly use this first ray mantram. And thus I stand. COPYRIGHT/REPRODUCTION LIMITATIONS: This data file/publication is the sole property of Vivika-Qi Speaks Up . . .™ It may be printed or emailed in its entirety for the reader’s personal use or to pass on to family and friends, not for monetary gain. It may not be altered or edited in any way and all reproductions of this data file/publication MUST contain this copyright notice. This material is NOT to be posted or transmitted publicly/electronically on ANY website, web page or ftp site other than: http://www.1viveka.wordpress.com. Copyright © 2007, Vivika-Qi Speaks Up™, PO Box 233 Mandeville, LA 70471.